Seems to be the look on Jackie Oliver’s face. He and the delightful young lady are aboard Jackie’s ’74 Can Am Championship winning Shadow DN4 Chev. It’s the London Olympia ‘Speedshow’ on 2 January 1975. 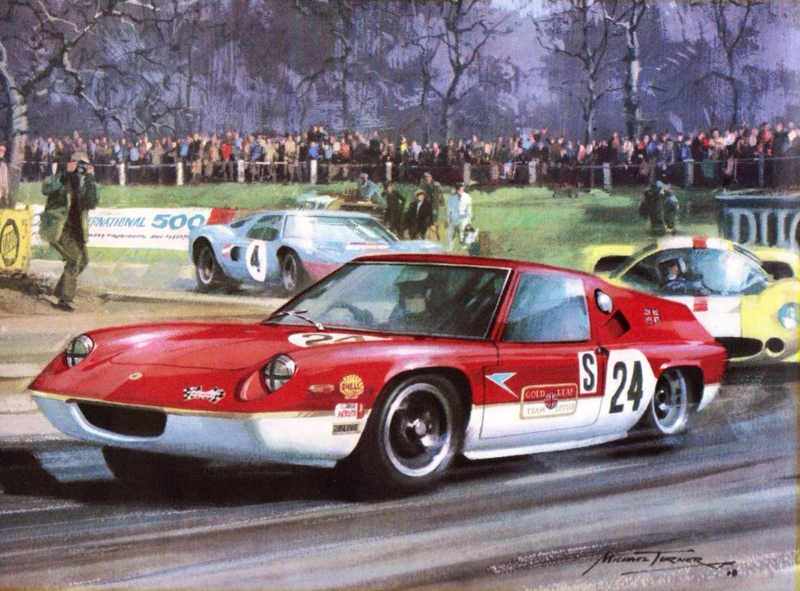 By 1974 the heyday of the greatest motor racing spectacle on the planet was over, the Porsche roller-coaster effectively did that in 1972/3 as well as some poor decision making by officialdom which drove the likes of Jim Hall from the series. Sans Chaparral the show was never quite the same. 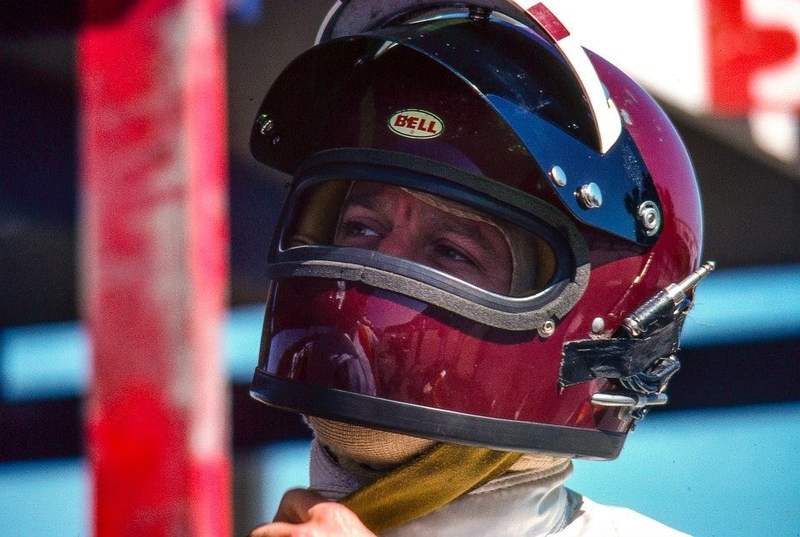 Longtime Don Nichols driver Oliver didn’t have an easy time of it in 1974 though, his teammate and ’72 Can Am champ George Follmer gave him a serious run for his money. Oliver won 4 rounds, George followed him home in 3 of them. Scooter Patrick won the other round in an old McLaren M20 Chev. 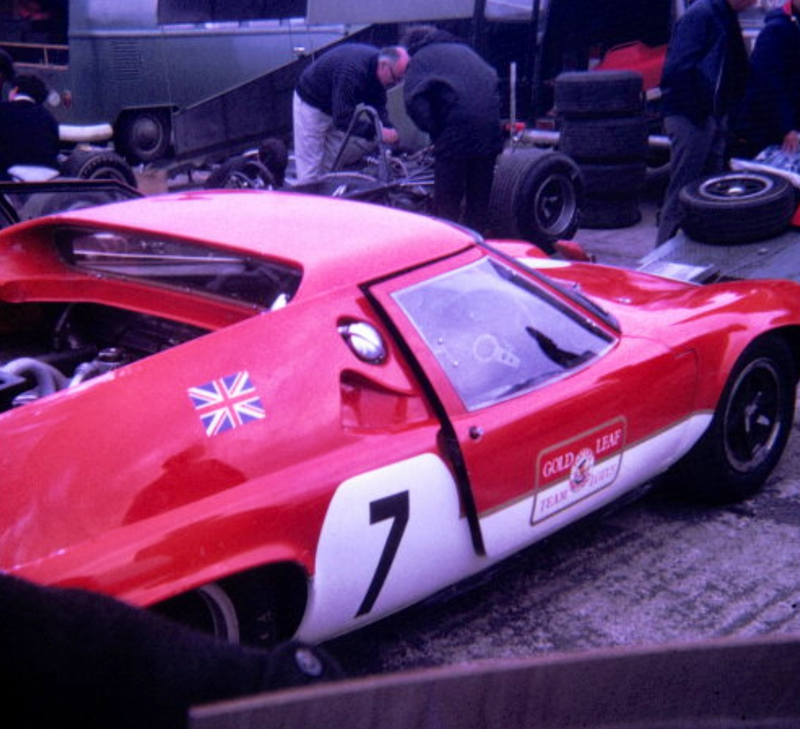 Oliver’s Lotus Components entered Lotus 41B was the most successful of the Lotus works entries, he finished 11th. 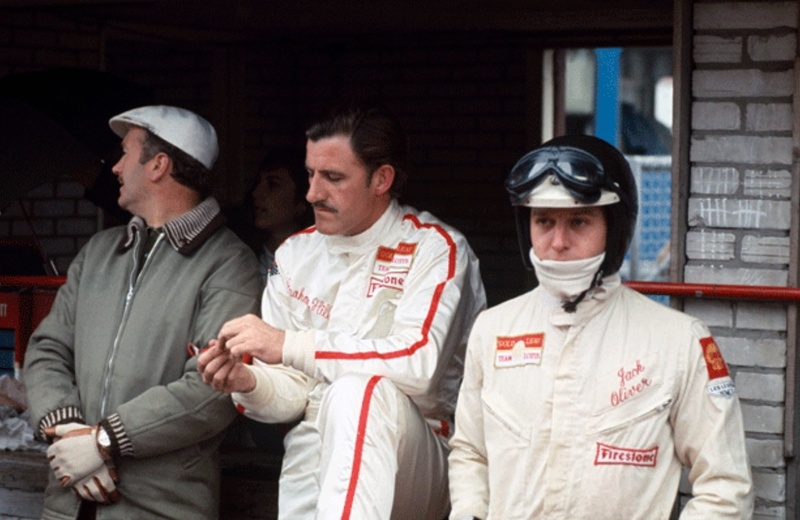 The Team Lotus duo of Graham Hill were 15th with Clark retiring with fuel metering unit failure. 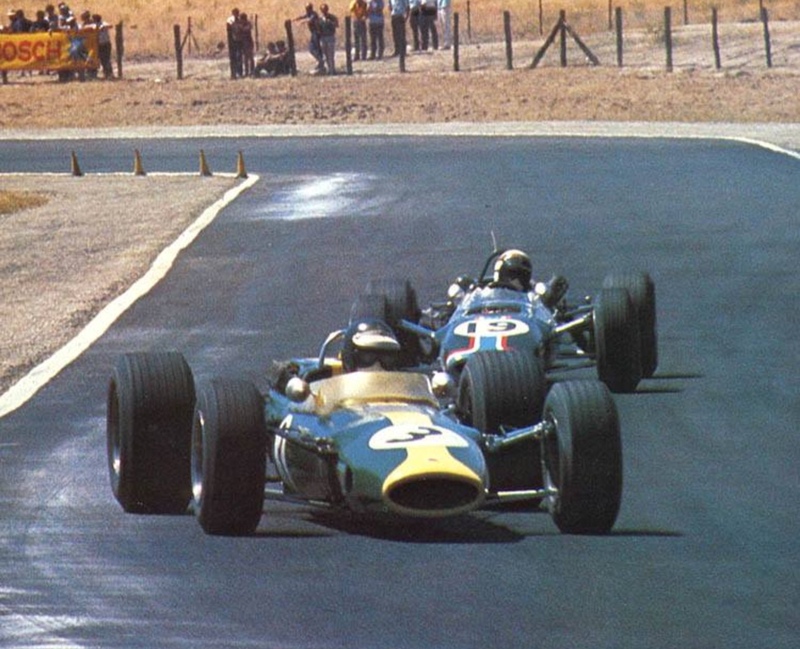 The latter two drove Lotus 48 Ford FVA’s, Oliver’s car was an update of Lotus’ 1966 contender. 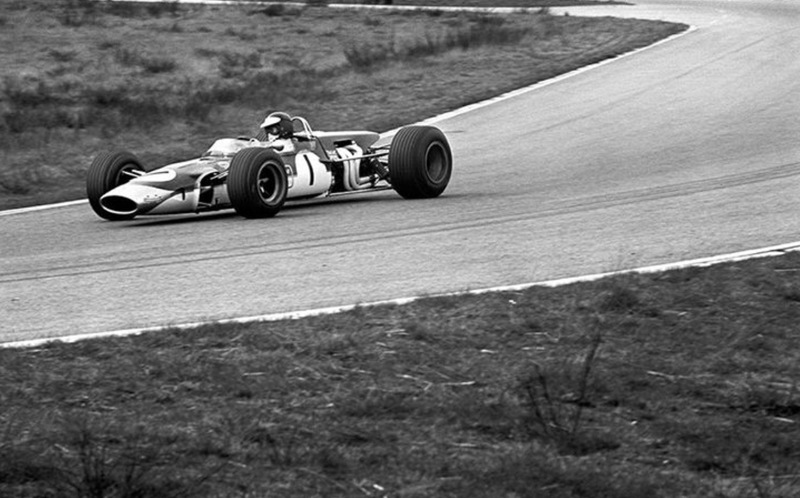 Jochen Rindt won the race in a Brabham BT23 FVA. 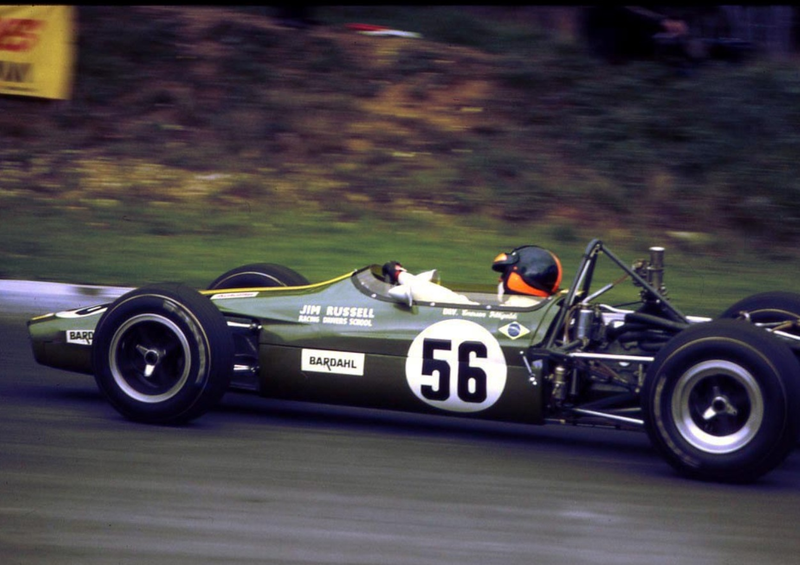 Oliver raced for the Charles Lucas factory Lotus F3 team in the second half of 1966, driving a Brabham BT18 Ford and Lotus 41 Ford finishing third in the Les Leston British F3 Championship, Harry Stiller won it from Chris Lambert. 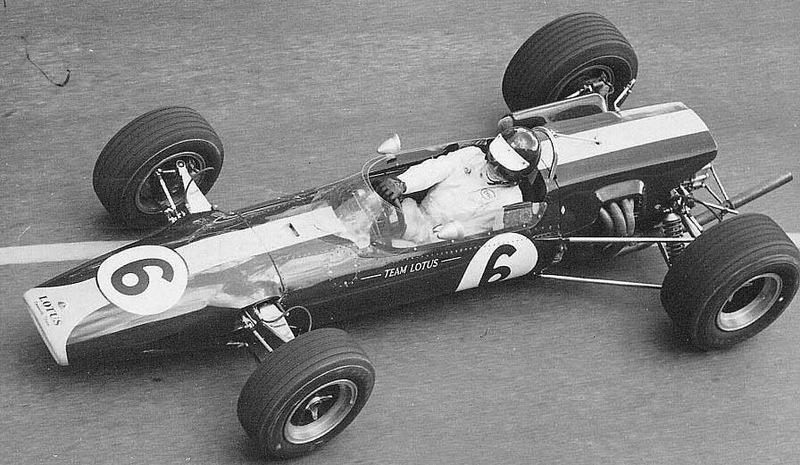 For 1967 Oliver contested the British F2 Championship, finishing 5th, as well as many Euro F2 rounds, for 1968 he was a member of the ‘works’ F2 team racing Lotus 48’s together with Jim Clark and Graham Hill. 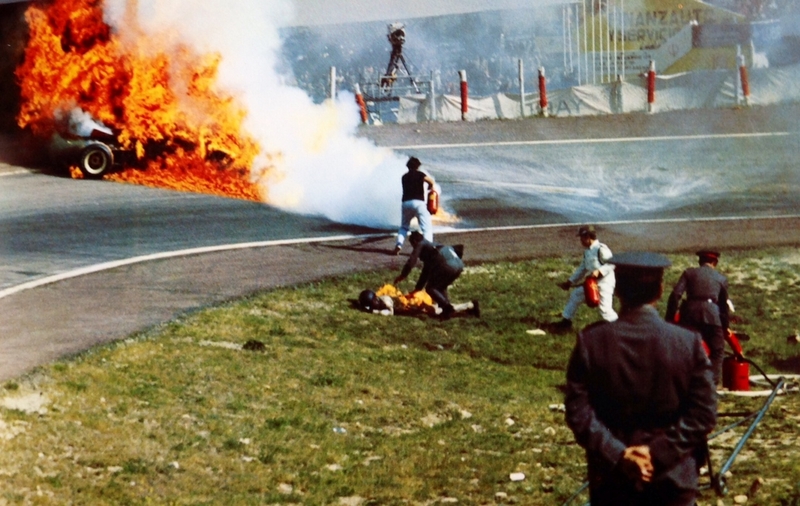 Then, in the worst of circumstances he ascended to the F1 team upon Jim Clark’s death at Hockenheim on 7 April during the second round of the 1968 Euro F2 Championship. 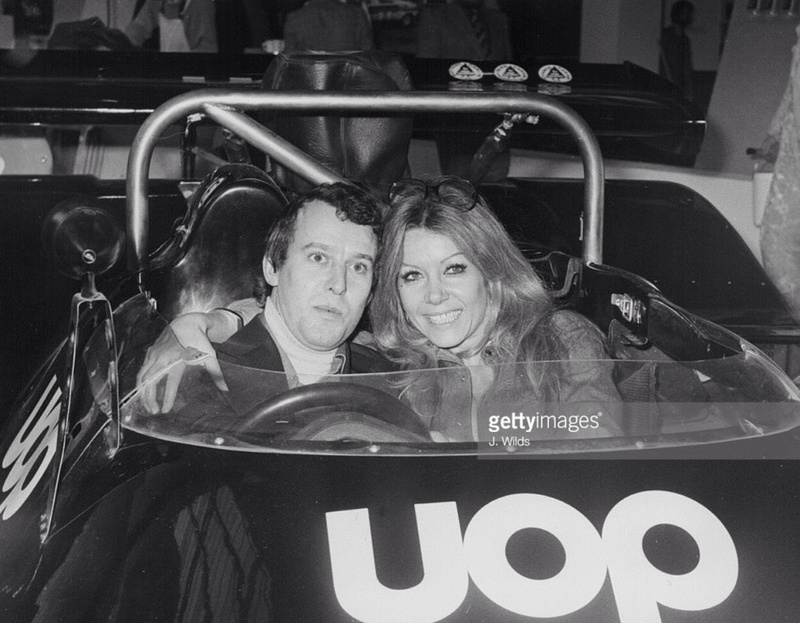 Oliver was 5th in the championship won that year by Henri Pescarolo’s Matra MS5 Ford, Rindt the dominant driver, as ever, in the category but ineligible for the title as a graded driver. 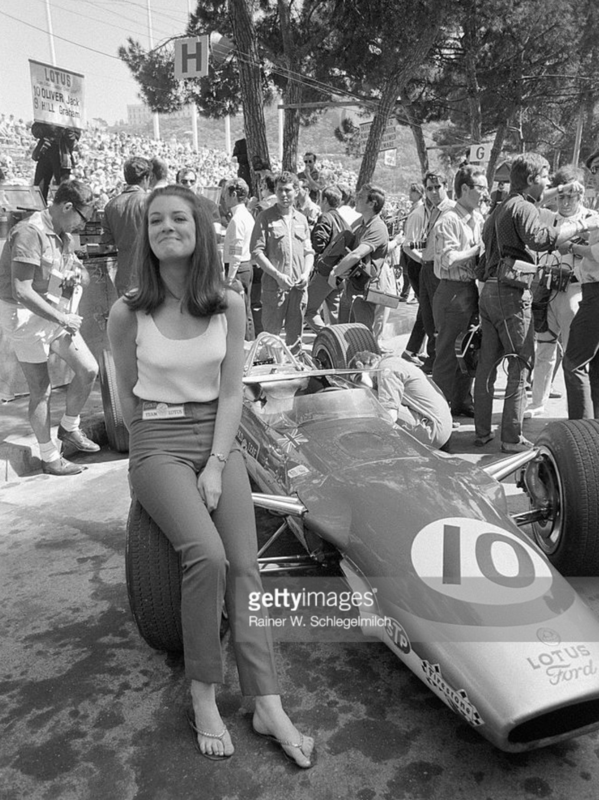 Olivers first Gold Leaf Team Lotus F1 race was the Monaco Grand Prix in which he qualified his Lotus 49B Ford 13th but was out on the first lap after colliding with Bruce McLaren. 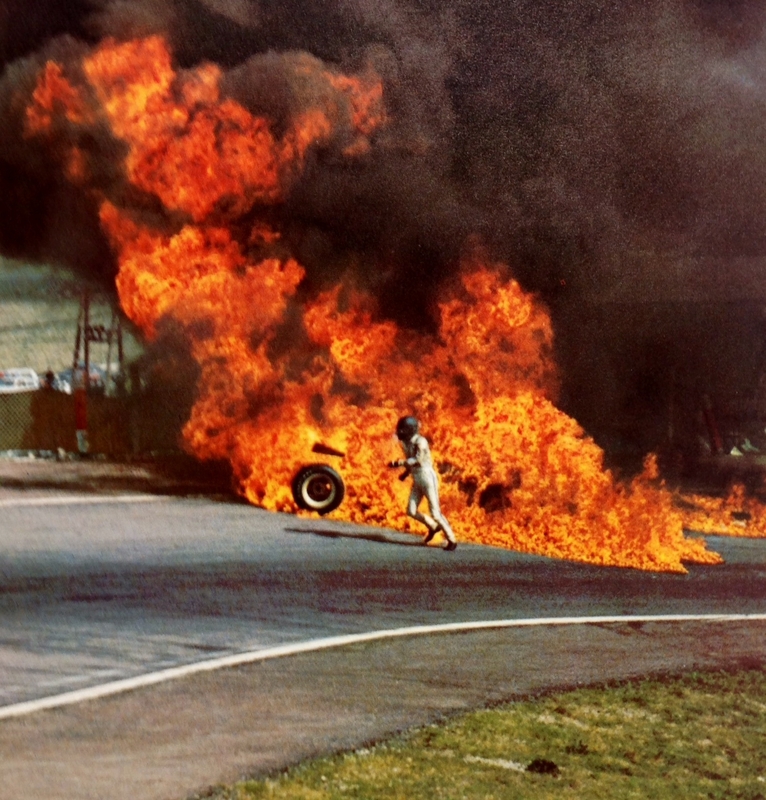 In a character building year, he had a monster accident at during French GP practice when the cars rear wing support failed-pinging the fence of a chateau on an amazing 125mph trip thru the Rouen countryside. He was able to walk away but the car was hors ‘d combat, so that was his meeting. 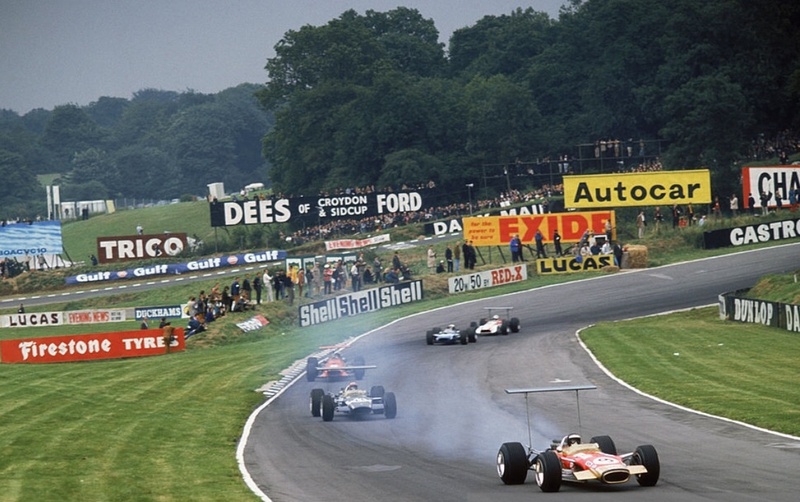 His best result from a year in which Graham Hills tour de force of leadership gave him and the team world titles was Q2 in his home race at Brands Hatch, the race won by Jo Sifferts Rob Walker Lotus 49B, and 3rd in the season ending Mexican GP, Hill was the winner of that race. 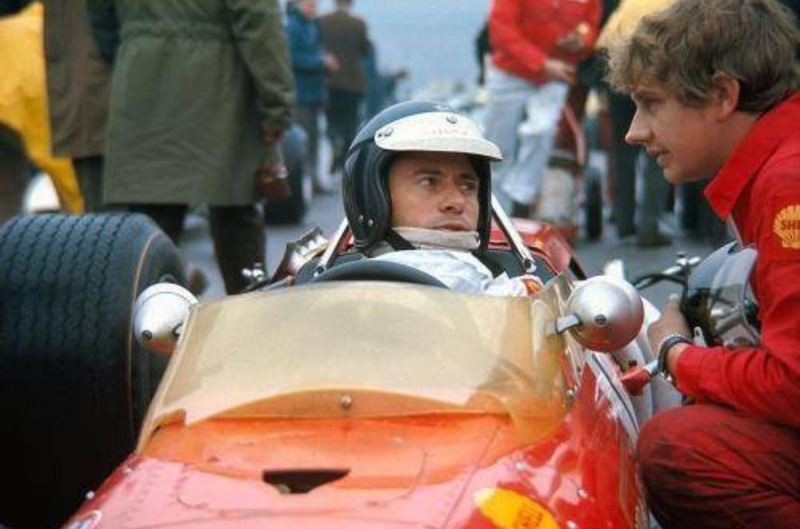 For 1969 Jackie was off to BRM, Jochen Rindt took his Lotus seat for 1969 in an ‘all star’ team with Hill. It was a tough year in 1969 as BRM had ‘lost their way’ in a design sense, the P133/138/139 uncompetitive, better was to come in 1970 with the Tony Southgate designed P153. Statistically the most successful FJ/F3/F2/FB cars of the 1960’s were Ron Tauranac’s spaceframe Brabhams which were built to a consistent design philosophy throughout. The cars were simple, strong, fast and forgiving straight outta the box. 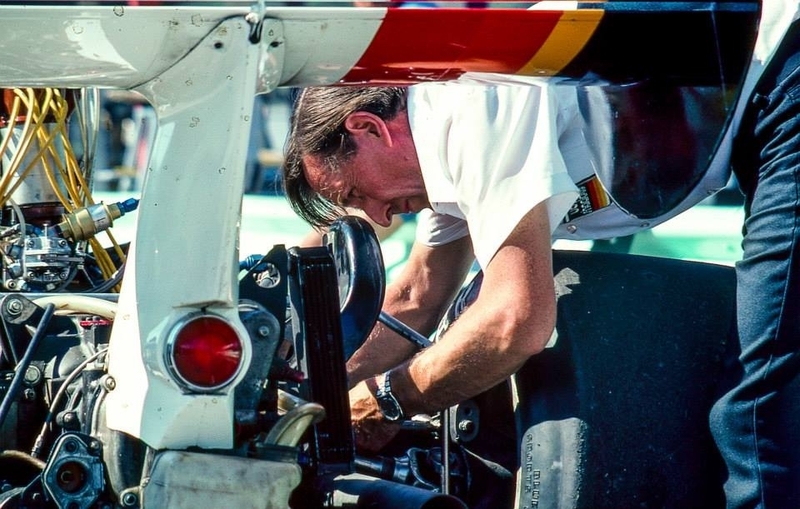 The latter because Jacks ‘finely tuned arse’ in testing contributed the ex-factory suspension settings which could be relied upon as a competitive, starting position by customers. Plenty of championships were won by not straying too far from them. 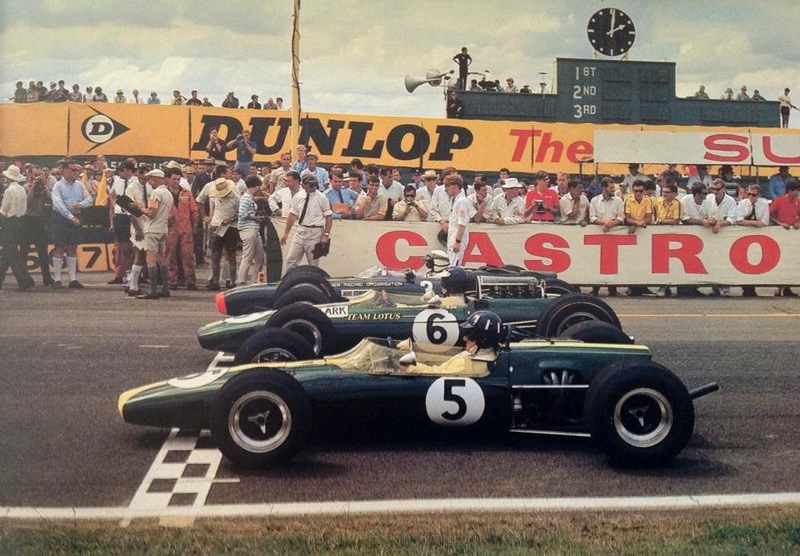 Lotus Components 1965 F2/3 car was the monocoque 35, a modified version of the 1964 32, with Clark winning plenty of races in the car including the Trophee de France, the Scot won 3 of the 4 rounds. Aussie John Joyce (later the designer of magnificent Bowin racing cars when he returned to Australia) with assistance from Dave Baldwin were briefed to build a spaceframe F3/F2 frame for 1966 designated the 41. The Lotus brains trust were having second thoughts about monocoque chassis suitability in the junior classes. Issues were cost, weight and utility and expense of repair. 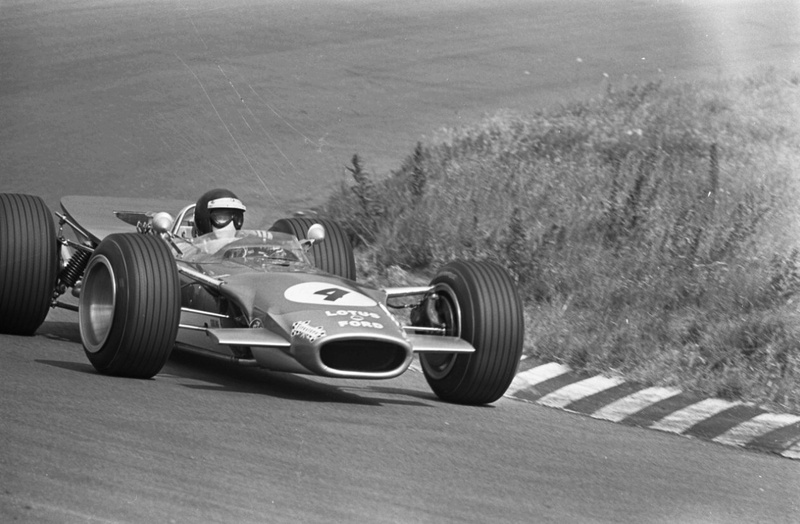 The 41 was raced from 1966 to 1968 and whilst a good car didn’t have the factory support needed to further develop it, the exception the Lotus Components 41 raced by Oliver. The chassis was also raced in the US FB class. 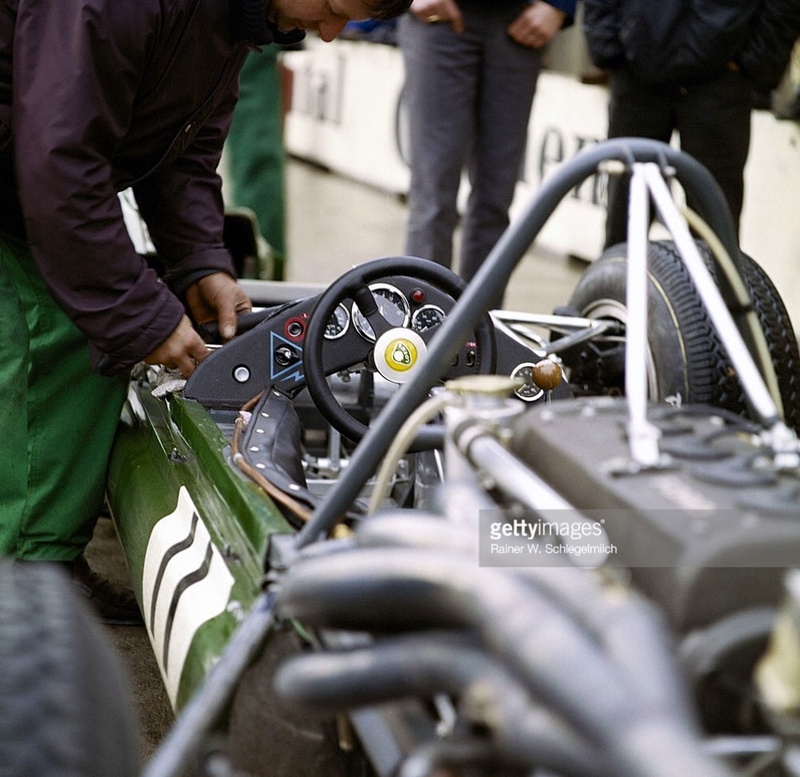 The works Lotus F2 car for 1967, the first year of the 1.6 litre F2, the Lotus 48 was a monocoque, the car Oliver raced was the customer 41B, a spaceframe. 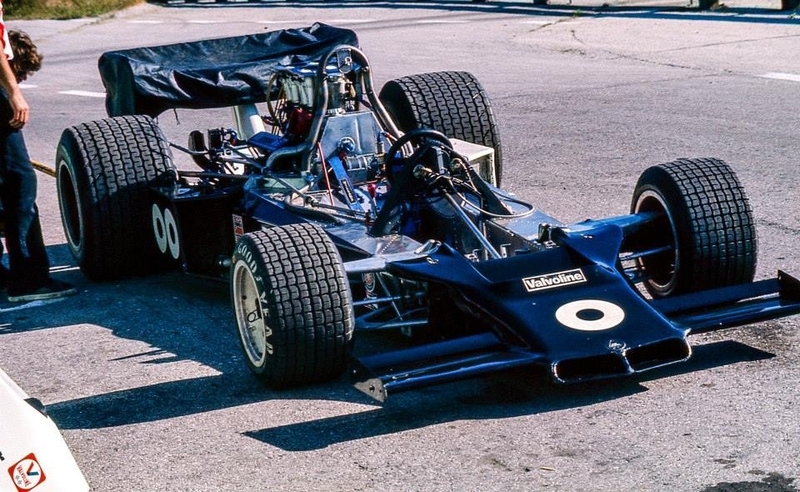 Chapman’s 1969 F3/F2 car, the Dave Baldwin designed 59 was a spaceframe. 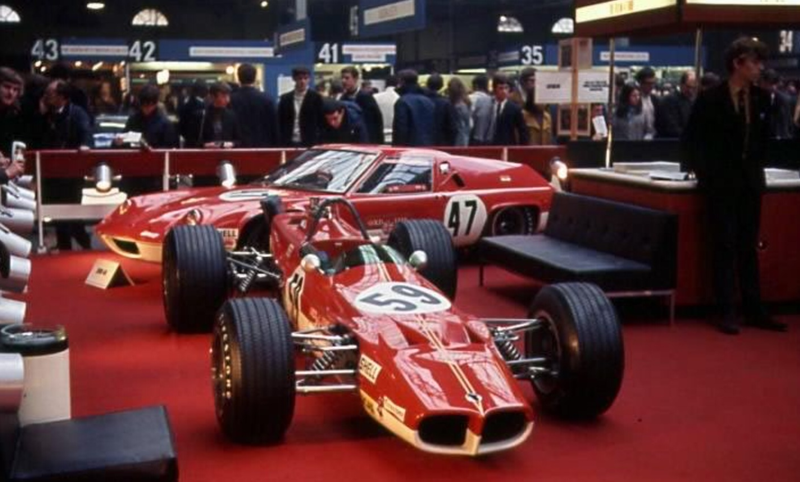 Its successor, the final Lotus production racing cars produced in volumes, the 1970 69 was a spaceframe for FF/F3 (spaceframe chassis are mandated in FF) and a monocoque for F2. Go figure!? Mind you, the 59 and 69 were very effective, successful tools whatever the variant. 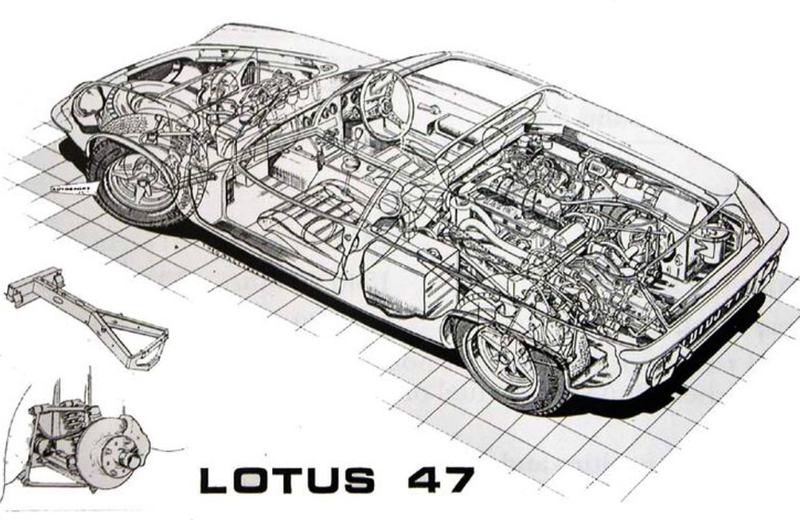 These Lotus chassis changes are only of arcane interest over the decade I guess. Perhaps the reasons for the choices were simply the opinions and preferences of the individual designer who worked on each cars design or layout, not that I am suggesting Chapman ever lacked clarity about design direction or objectives! Posted: October 7, 2015 in Features, Who,What,Where & When...? 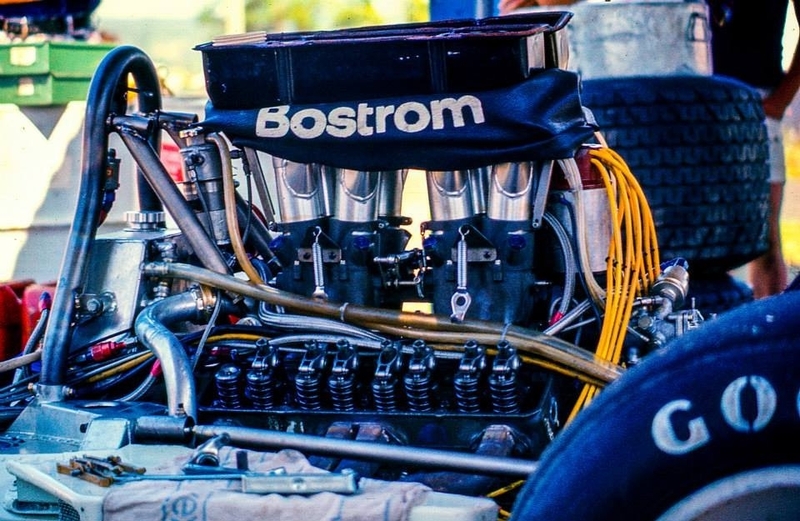 Chev engines won every championship F5000 race in the US from Riverside on 25 April 1971 when Frank Matich took a Repco Holden win in his McLaren M10B through until Oliver’s long overdue Shadow victory, the Lola T332 Chevs of Al Unser and Vern Schuppan were second and third. Whilst the Dodge was more powerful than a Chev it was also heavier making the packaging of the car and its big cast iron V8 a challenge for designer Tony Southgate. 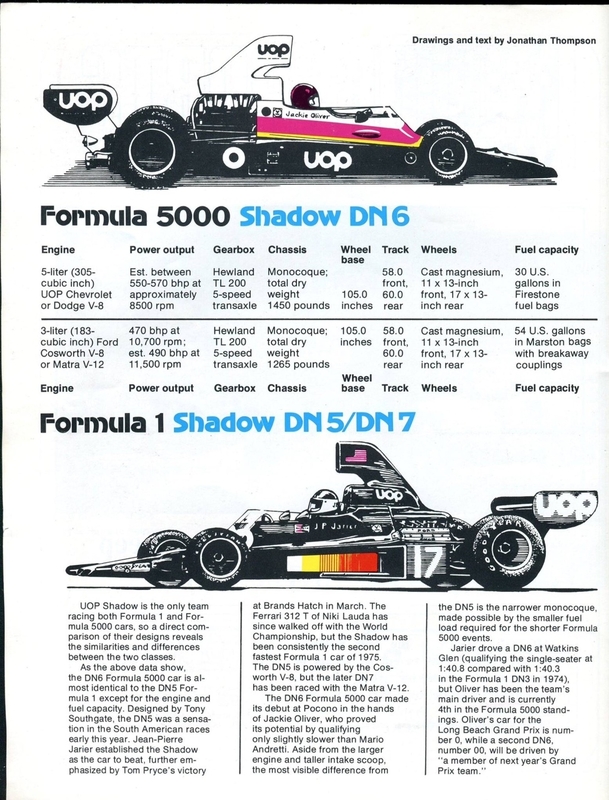 The Shadow DN6 was based on Tony Southgate’s very competitive DN5 F1 design and was first raced in 1975 powered by the ubiquitous Chev V8. Oliver took 4th place in the championship won by Redman’s T332, the car raced well at both Watkins Glen and Road America. 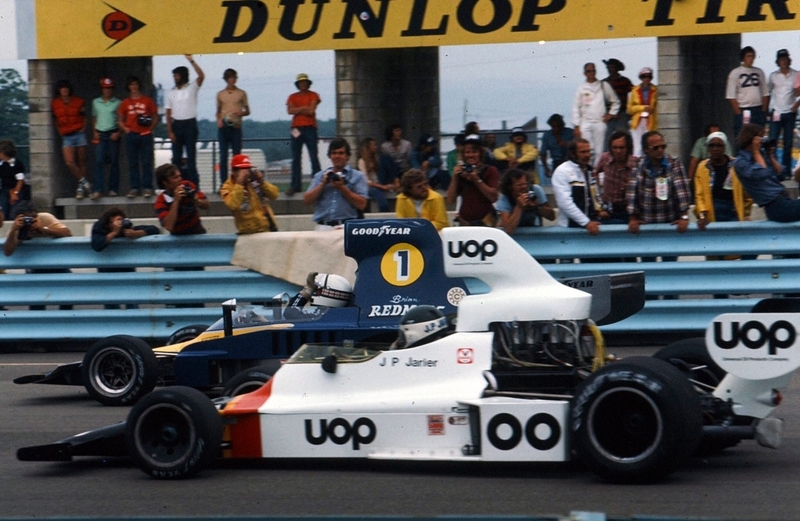 F1 drivers Jean Pierre Jarier, Tom Pryce and Jody Scheckter each raced a second car in three rounds at Watkins Glen, Long Beach and Riverside respectively. All three qualified in the top 5 but retired with mechanical maladies. 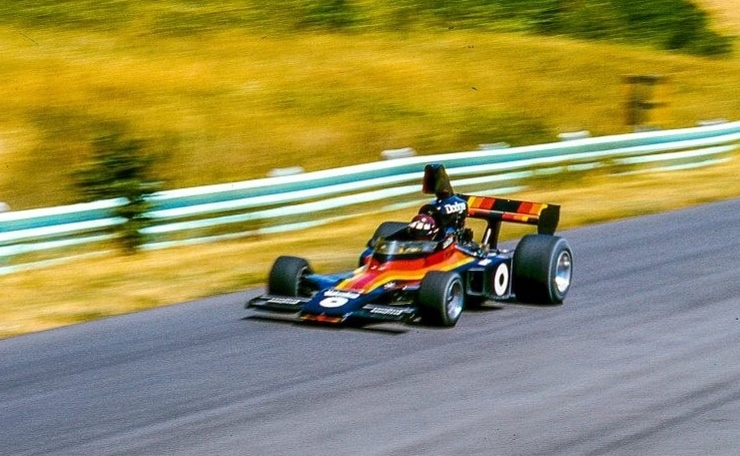 The following Shadow press release written by Rob Buller prior to the Mosport round, the second of the 1976 season, reproduced on the My Formula 5000 website outlines changes to the car and program over the 1975/6Winter. ‘Development work on the DN6 5000 car has continued over the winter under the direction of Chief Mechanic Ed Stone and Engine builder Lee Muir. 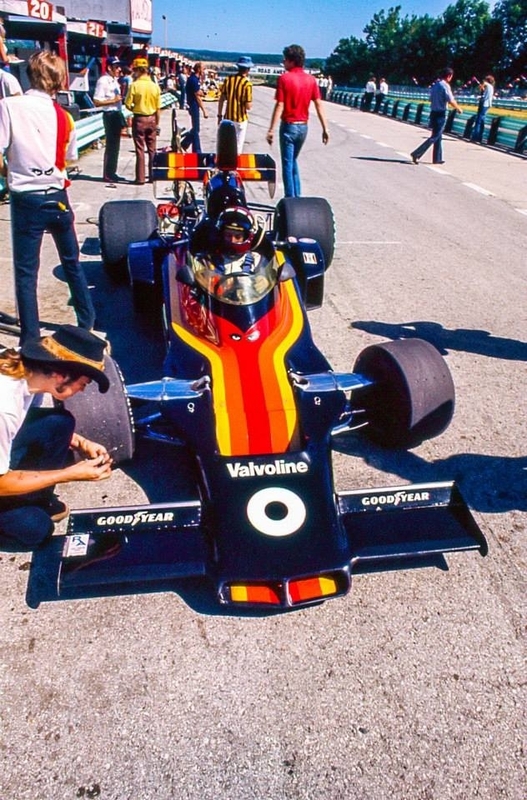 Stone joined the 5000 effort late in 1975 and immediately set about making chassis and suspension changes.’Basically the 1975 season progressed with little development, there wasn’t much time.’ Stone said in a recent telephone interview, ‘I was asked to make some suspension changes and the car was more competitive at the last 1975 race at Riverside with Jody Scheckter driving. ‘But the heart of the Shadow development is the new Chrysler power-plant, a joint venture between Shadow and Chrysler’s Plymouth Division. The engine starts life as a 340 cu. in. stock block that is down-stroked to 305 cu. inches. It is fitted with the same injection system that is used on Richard Petty’s NASCAR Dodge. 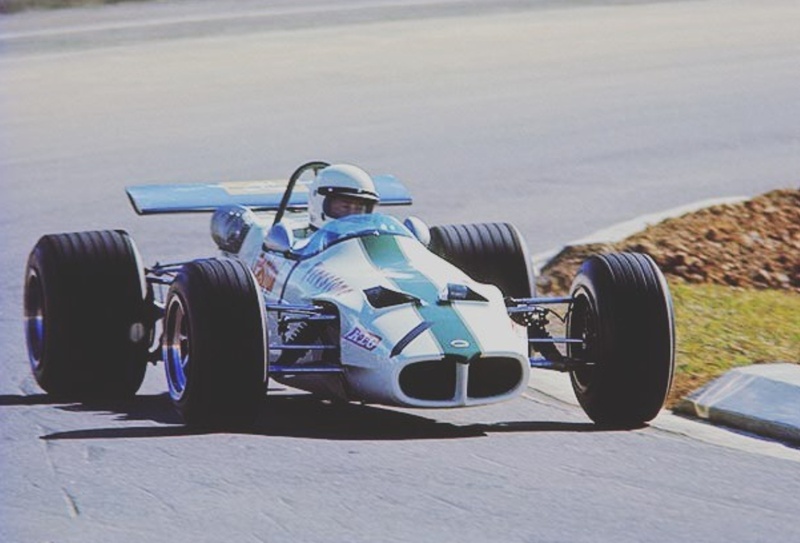 Chrysler, which is heavily involved in NASCAR and Drag Racing, is new to F5000 racing, a class that has been dominated by the rugged Chevrolet 5 litre engine. As a part of their new kit-car package now under development, Chrysler has contracted with Shadow to do the engine development and sorting. They supply the engine components to Shadow engine expert Lee Muir, who then hand builds and dyno tests each engine. 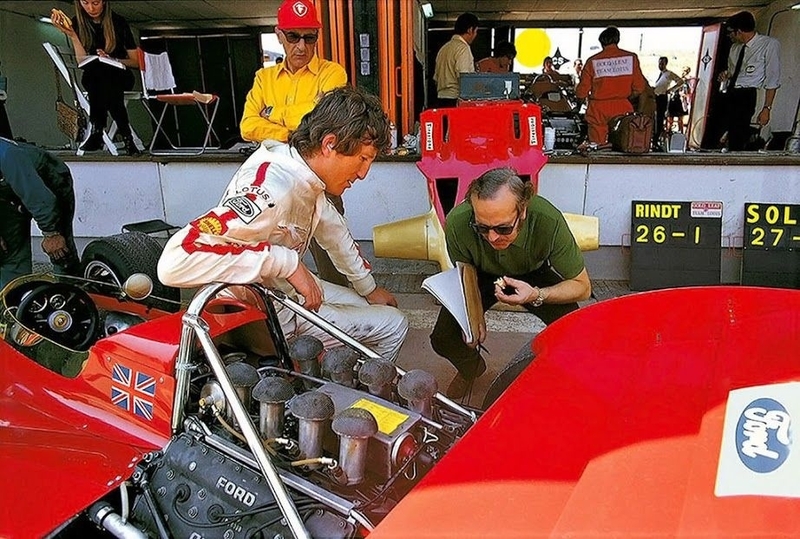 Chrysler also helps with technical information and advice to Muir, who came to Shadow from McLaren’s engine department. 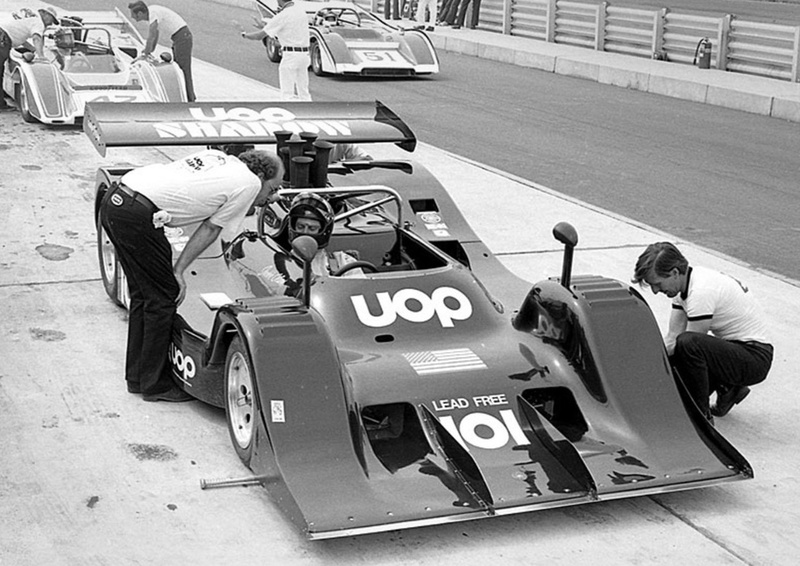 ‘The first outing in 1976 for the Shadow Dodge DN6 was at Pocono, Pennsylvania for the Series opener. Although they weren’t quite ready for the Pocono race, they were very encouraged with the results. Oliver was lying third in his qualifying heat when a connecting rod developed terminal stretch. As they only had one dyno’d engine a spare practice unit was installed for the feature. However, a fuel pump seal split on the grid and it took 5 laps to change. By the time he joined the fray Oliver was hopelessly behind but by charging hard he was able to run with the leaders. With that encouraging performance Stone and Muir returned to Phoenix Racing headquarters in Chicago and started preparation of the Shadow for the Mosport race. Further chassis mods have been made utilizing new springs, roll bars and revised suspension settings. To help weight distribution, the water rads have been moved forward a la McLaren Indy car. Muir will have three completely dyno’d engines ready for Mosport’. 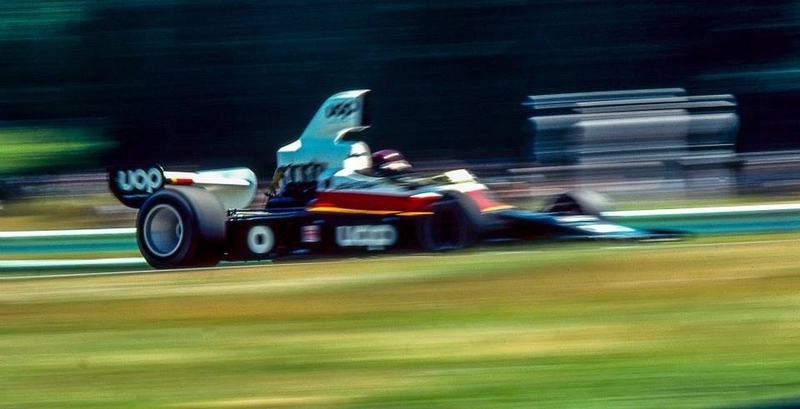 ‘Sponsorship for the F5000 effort is a problem for Shadow. Since the departure of UOP, Nichols has been unable to get the full 5000 program underwritten. Various sponsors are now supporting the Formula One effort on a per race basis while only Goodyear, Valvoline and, of course, Chrysler are behind the 5000 effort. Thus Shadow must watch their budget closely and this, the team feels, will restrict the amount of development they can attempt. Nonetheless the 5000 effort has Don Nichols full support and he won’t field cars unless he can be competitive. And with the driver, new engine and chassis changes he plans to be competitive’. 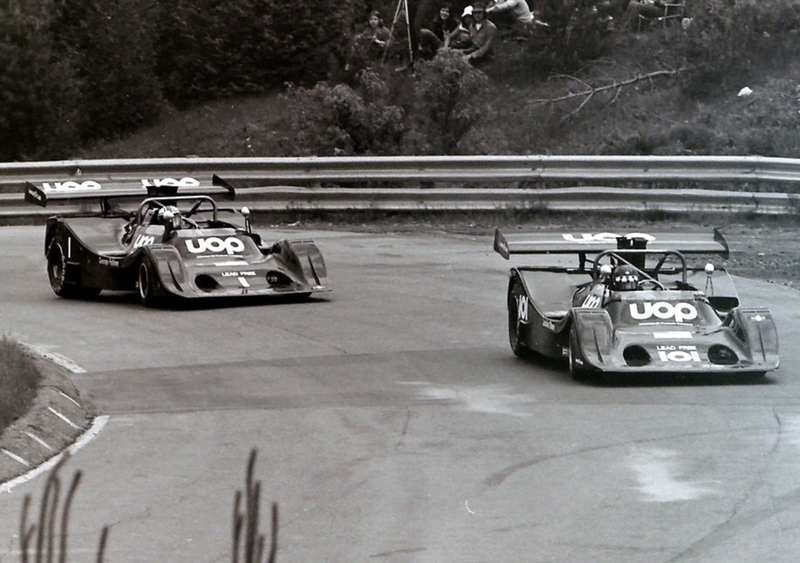 Oliver lead at Mosport but was held up by a backmarker, Alan Jones snaffling the win, inevitably in a Lola T332 Chev. 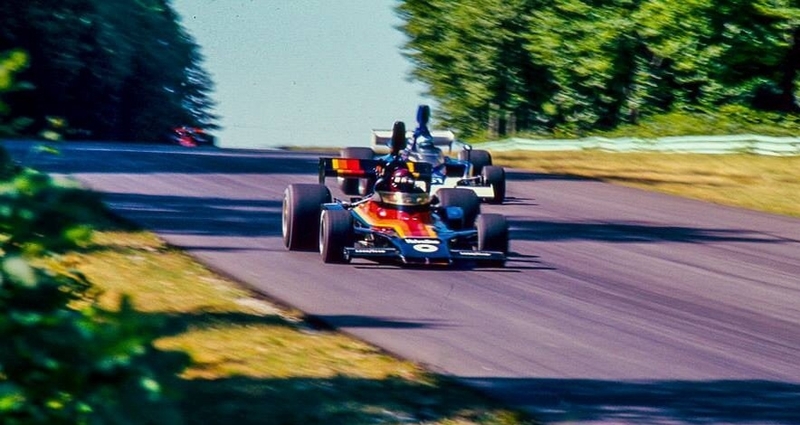 Three weeks later he lead at Watkins Glen but a cracked sump ended his race, the Shadow finally won at Road America, Elkhart lake, Wisconsin. It was a good win as Ollie had to overcome diff and flat tyre problems in his heat which meant he started 14th on the grid of the final. 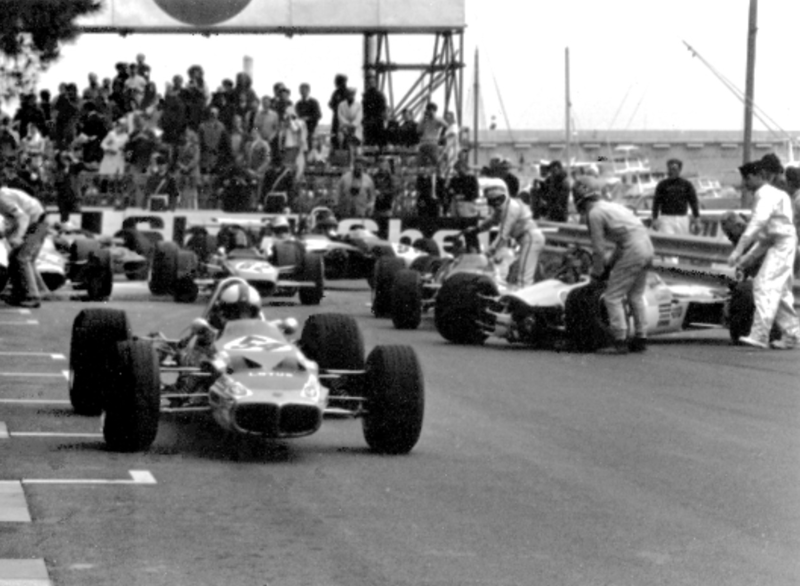 After 16 laps he was 3rd, within 3 laps he was past the Lolas of Al Unser and Brian Redman and took a strong win for the team. 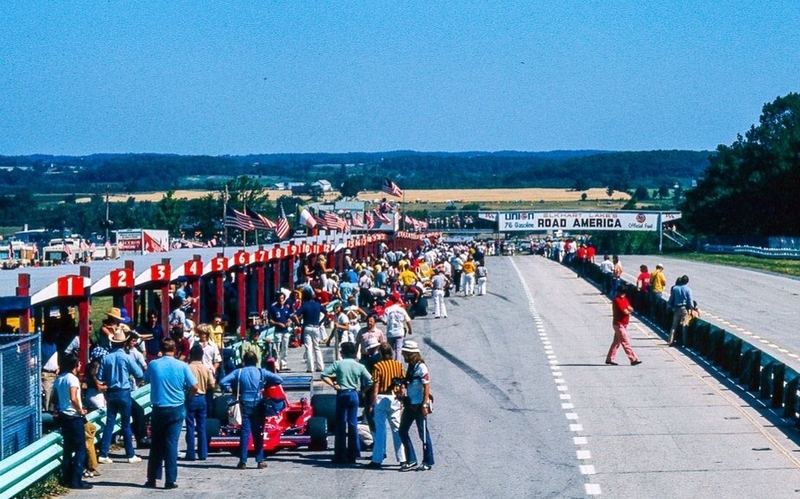 Two second places at Mid Ohio and Watkins Glen secured third place in the championship again won by Redman’s Haas/Hall Lola T332. 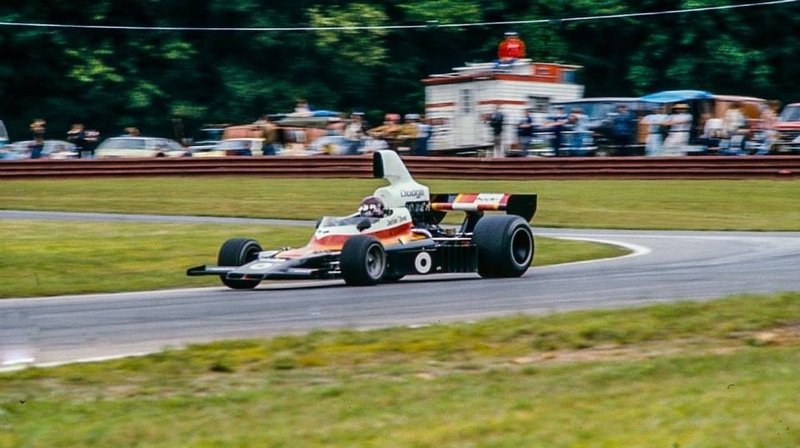 With the demise of F5000 in the US at the end of 1976 and its evolution into 5 litre central seat Can Am from 1977 the Shadow’s raced on into 1977 and 1978 but without success, Lola’s T332/T333 the dominant cars in the early years of the class. Elfin MR8 Chev & James Hunt. 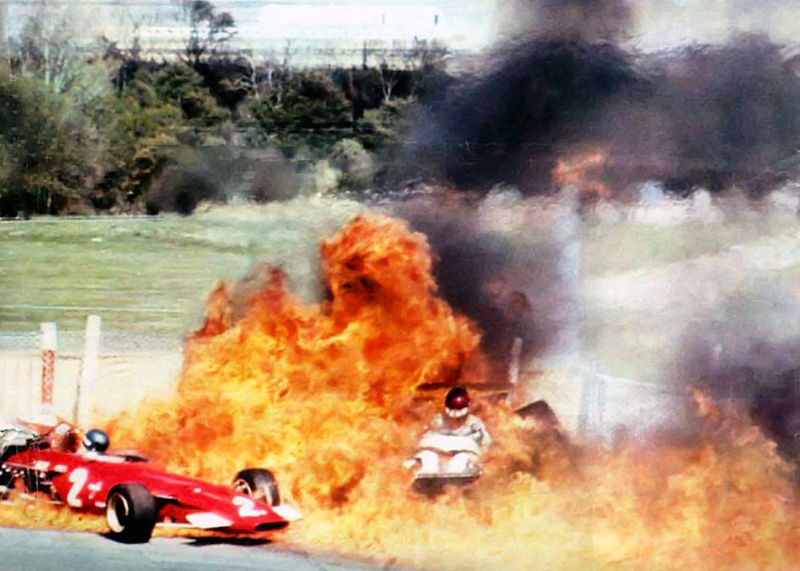 Frank Matich and his F5000 cars. Their new F1 Lotus 49’s await their return to Europe, the Ford Cosworth powered cars established a package of integrated design which became the F1 standard for the duration of the 3 litre formula. 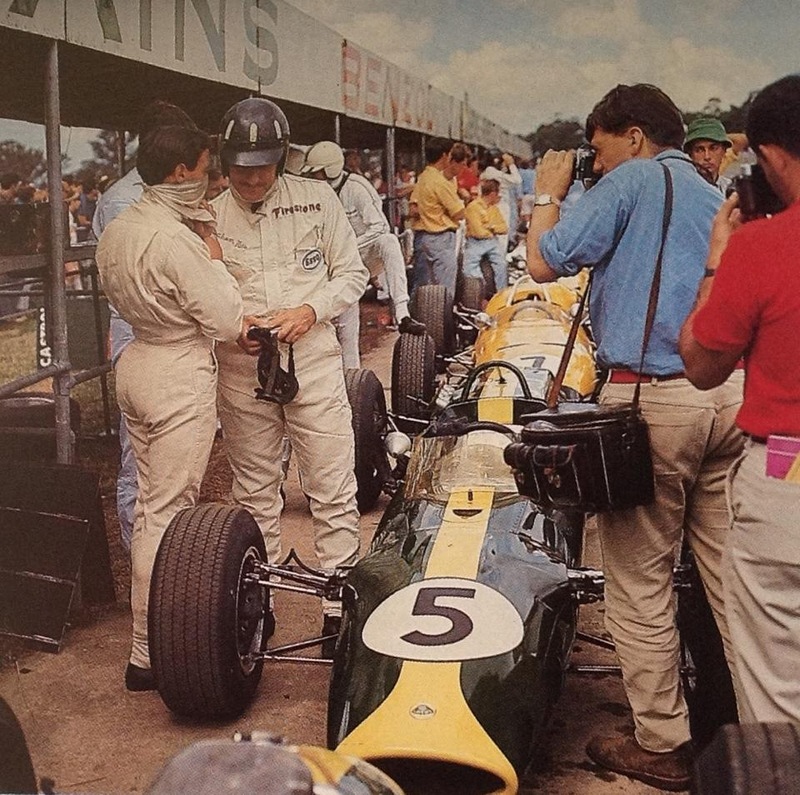 Their is plenty of press interest in the two stars, teammates for the first time in 1967 and Hill’s #5 Lotus 48. Behind them in the ‘Farm pitlane is Kevin Bartlett’s Brabham BT11A Climax, KB just in shot with his foot on his front Goodyear. Sixth in the race for him, an excellent result in the old car. 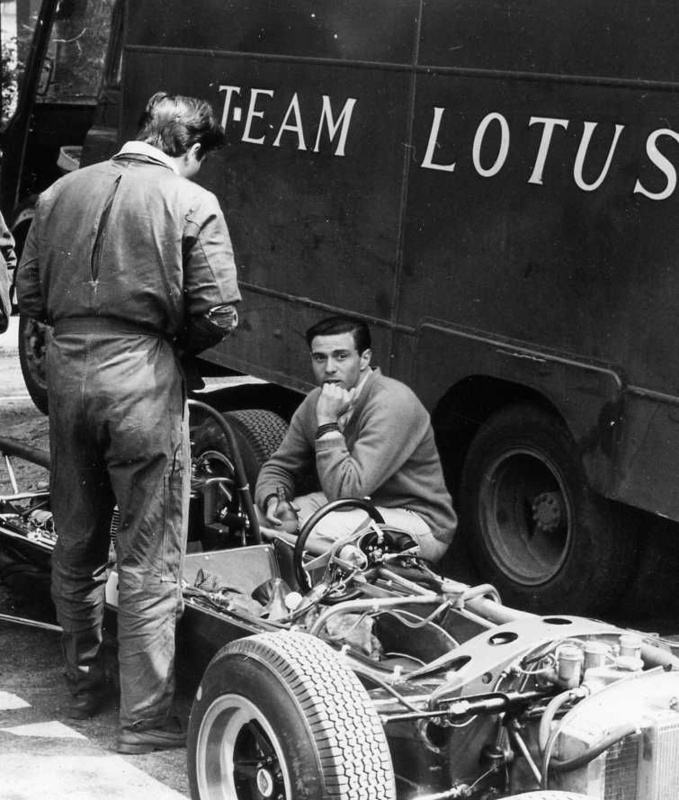 The 48 was Lotus’ new car for the inaugural 1.6-litre F2 1967 season. 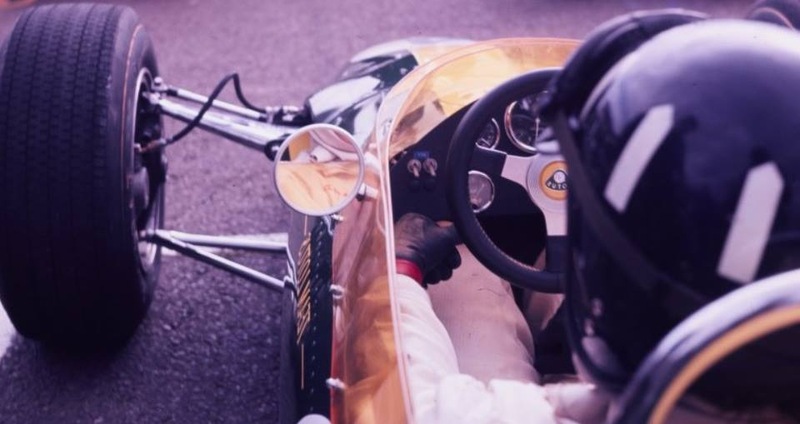 Designed by Colin Chapman and Maurice Philippe, it was in essence a ‘mini’ Lotus 49 which made its successful debut in the ’67 Dutch Grand Prix on June 4. Keen to get in some early season testing of the new car, Colin Chapman sent the first chassis to Australia for the Warwick Farm round of the Tasman Series, the Australian GP that year, held on 19 February for Graham Hill to drive. 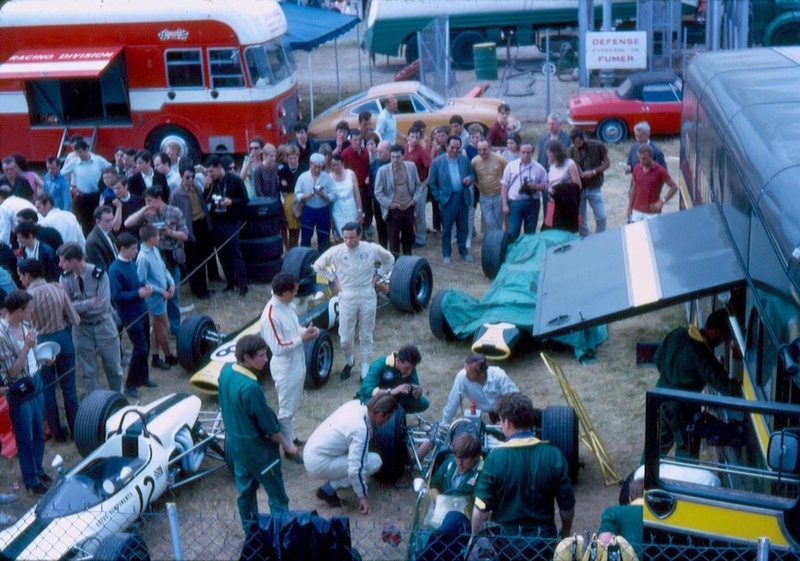 Hill was popular at the Sydney circuit, the promoters paying plenty of money to get the Brit and his new Lotus to New South Wales for just one race. 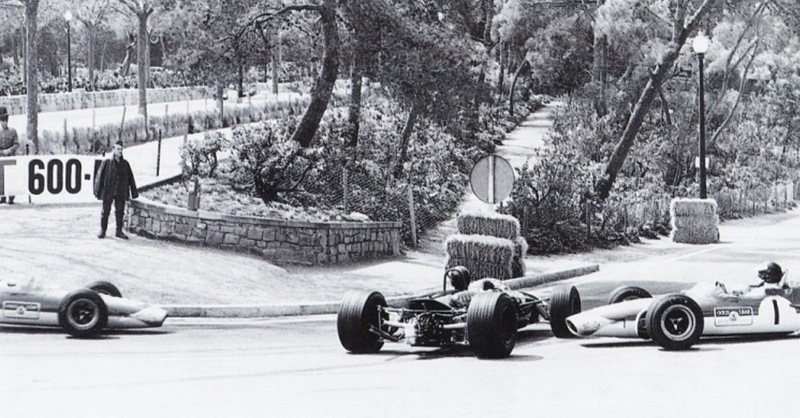 Of added local interest was that Hill had just returned to Lotus having been a BRM driver since 1960. Mind you, in Australia he raced in our internationals the Ferguson P99, Brabham Climaxes owned by ‘Scuderia Veloce’ as well as various BRM’s. 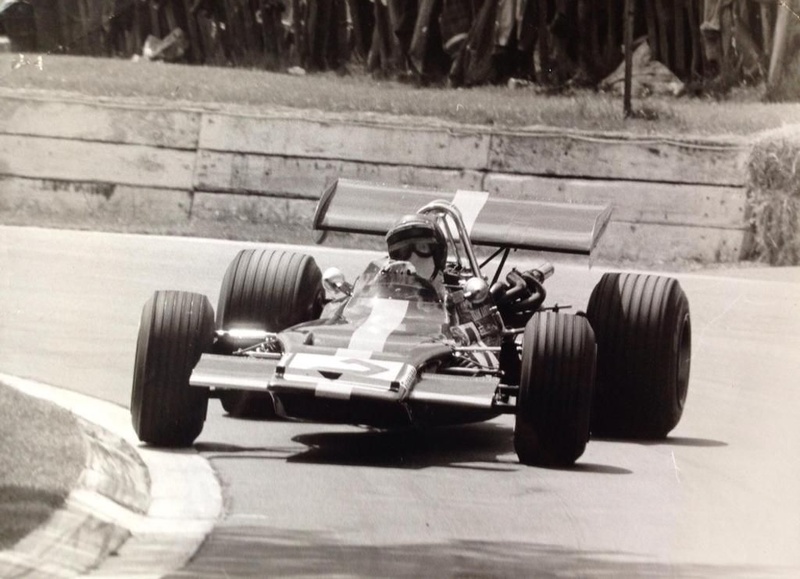 Jim Clark did all of the Tasman rounds in New Zealand and Australia that summer. 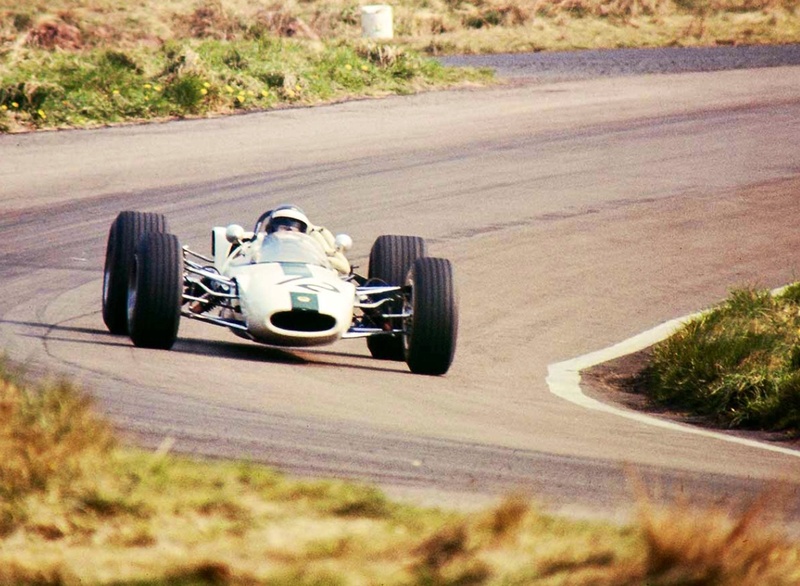 He won the title in a Lotus 33 Climax, his 1966 F1 mount ‘R14’ fitted with the 2 litre Coventry Climax FWMV V8 engine with which he started the 1966 F1 season, the first year of the 3 litre F1. 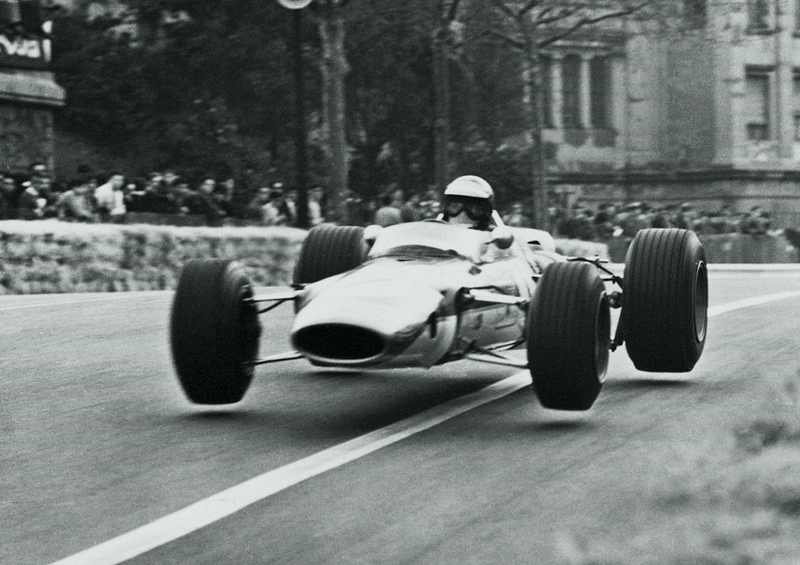 He used the car until the BRM engined Lotus 43 was ‘ready’ to race. The new 48 F2 car had a full monocoque chassis made from aluminium sheet with steel bulkheads front and rear. Bolted to the rear bulkhead was a tubular steel subframe which carried the unstressed FVA engine and ZF gearbox. Front suspension used top rockers operating inboard mounted springs and dampers. The rear suspension was also conventional; single upper link, reversed lower wishbone, twin radius rods and coil spring/ damper units. The 48 used the Ford Cosworth FVA, one of two engines contracted from Keith Duckworth and Mike Costin by Ford. 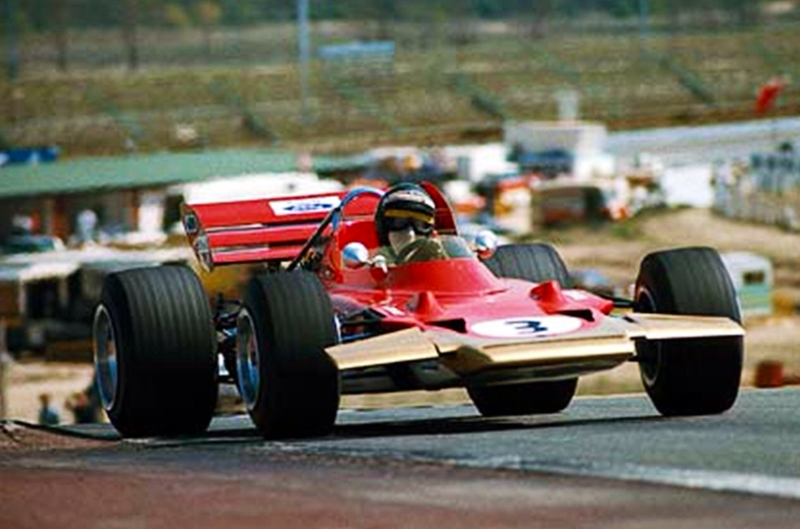 Significantly the engine proved Duckworth’s design direction for his F1 V8, the Cosworth DFV which made its race debut at Zandvoort in the back of the equally new Lotus 49. The FVA’s design commenced in July 1965, its first bench test was in March 1966 and its first race in July 1966. The engine was well tested prior to its trip to Australia in the summer of ’67. The remarkably successful unit combined a four-cylinder cast iron Ford Cortina block with an aluminium Cosworth head. FVA was an acronym of the ‘four valve assembly’ or ‘four valve type A’ of the engine’s new head. Twin overhead camshafts were used of course, driven from the crankshaft by gears. Equipped with Lucas fuel injection, the dry sumped engine developed circa 220 hp @ 9000rpm. 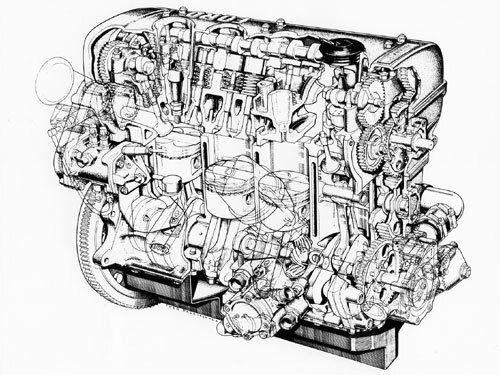 Ford Cosworth FVA Engine Cutaway drawing by Theo Page. 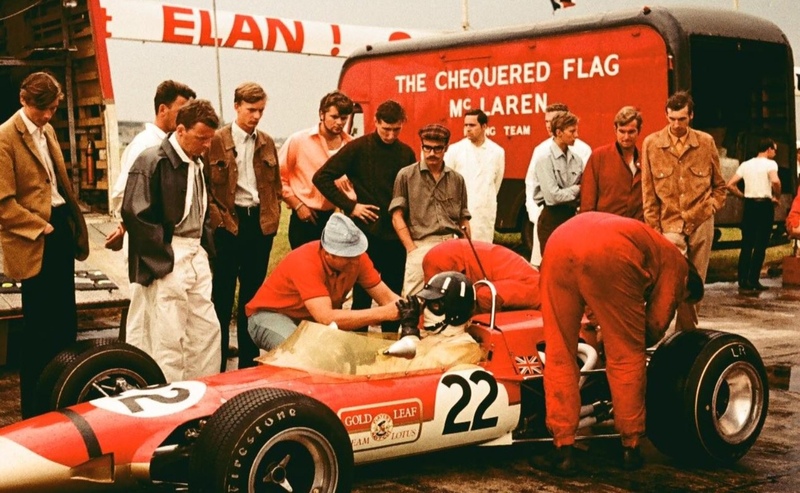 Graham Hill qualified Lotus 48 chassis ‘R1’ well amongst the Tasman Formula 2.5 litre engined cars, 3rd on the grid with only the V8 engined cars of teammate Jim Clark and Jackie Stewart’s BRM in front of him. He may only have had 1.6 litres but the chassis was clearly good and Hill was always been quick around Warwick Farm, the Sydney circuit a very technical one. 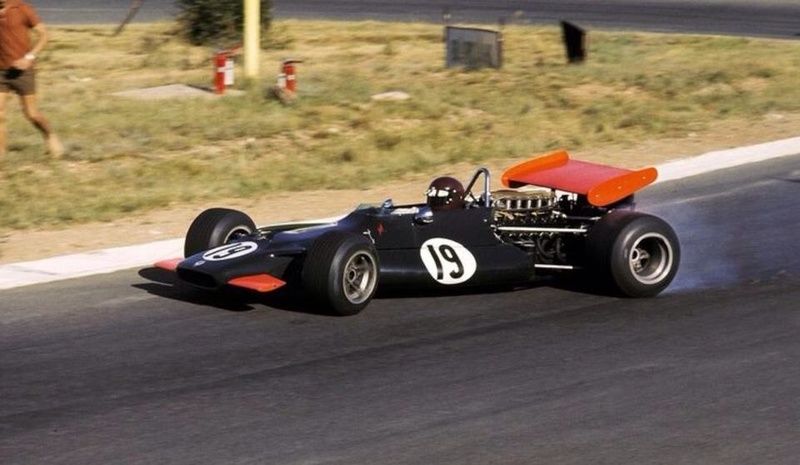 Stewart was very fast throughout the Tasman, he won it in ’66, but the BRM’s gearbox was at its limits with the greater stresses of the P60 BRM V8, now at 2070cc and developing much more power and torque than the same engine in its original 1.5 litre F1 guise ever produced. 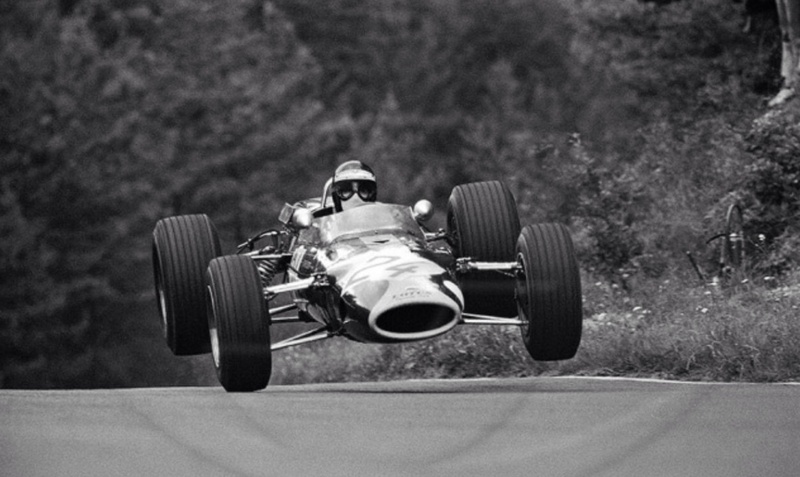 But the car held together at the ‘Farm, Jackie won from Clark and Frank Gardner in a Brabham BT16 Climax FPF, the old 2.5 litre F1 Climax four cylinder engine well and truly outclassed by ’67. 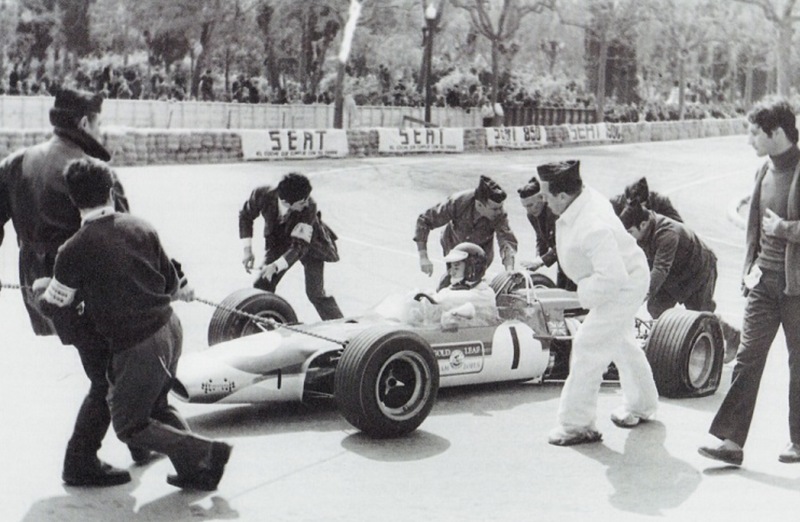 Hill’s new Lotus 48 expired with gearbox maladies on lap 25 but he gained valuable miles on the brand new chassis in advance of the European F2 season, which both he and Clark contested. 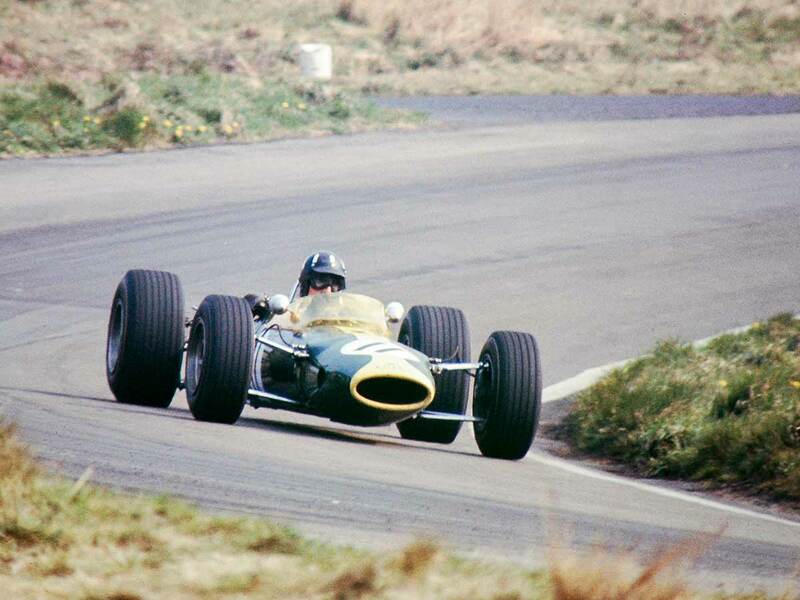 Intended as a customer car, the 48 was exclusively campaigned by Team Lotus during 1967, privateers used uprated 41’s. 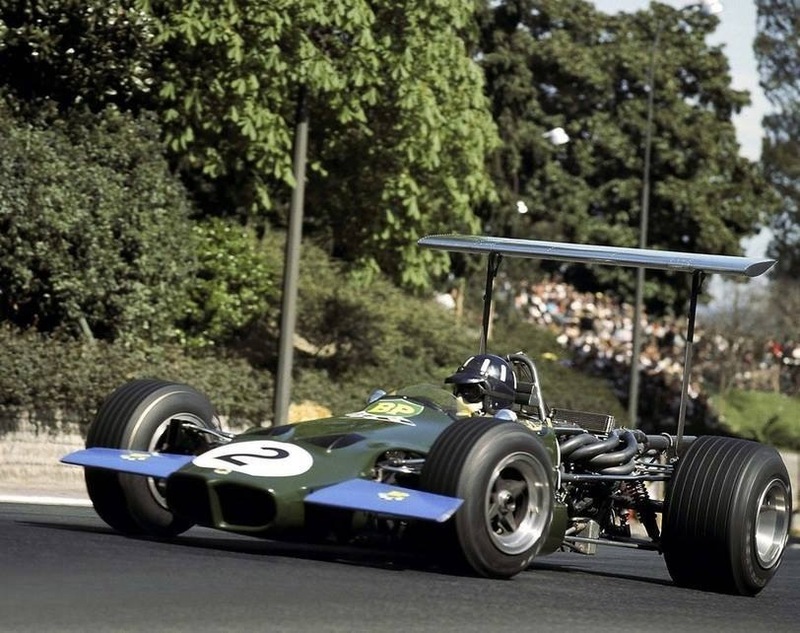 The new Lotus was quick but encountered the Brabham BT23, one of Ron Tauranac’s most successful designs. 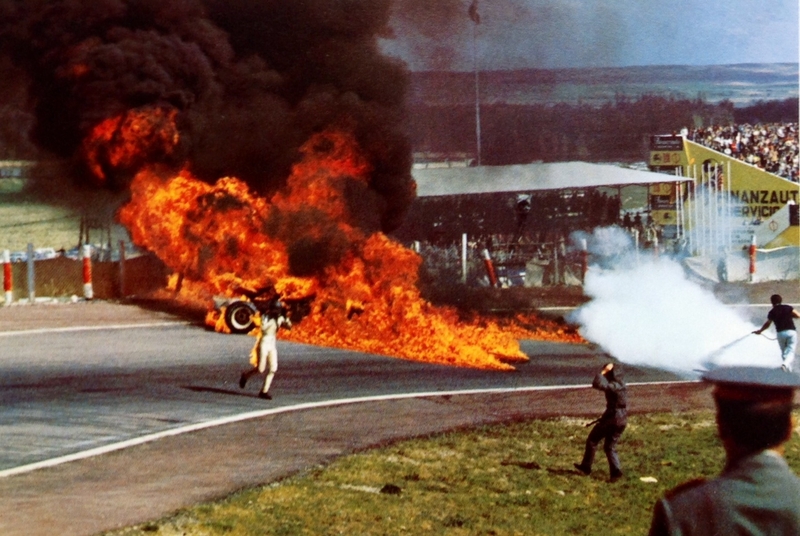 The 48 won four F2 races in 1967, three in Clark’s hands, the fourth by Jackie Oliver in the combined F1/F2 German GP at the the Nürburgring. 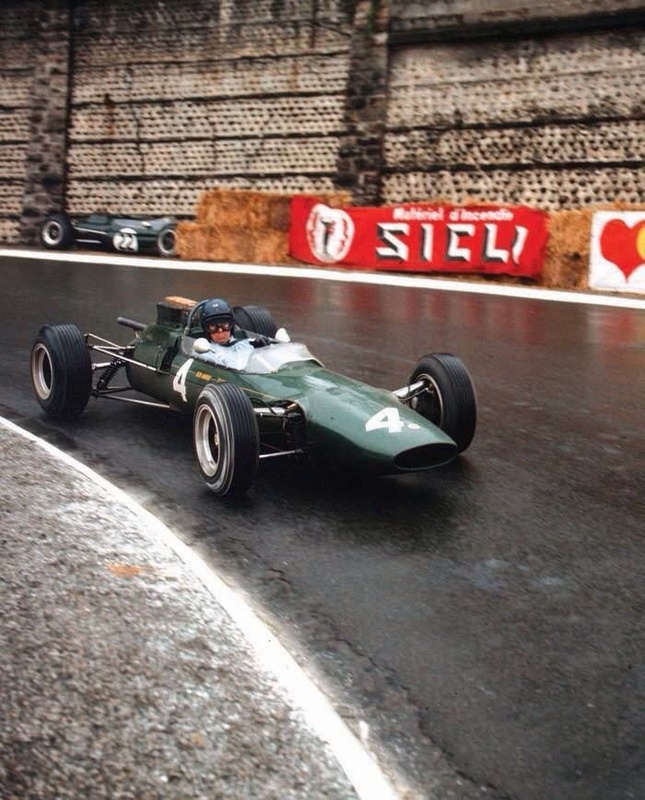 Whilst the Brabham BT23 was the car of the season many of its victories were taken by ‘graded drivers’, notably the ‘King of F2′ Jochen Rindt, whilst graded drivers did win races they could not score championship points. 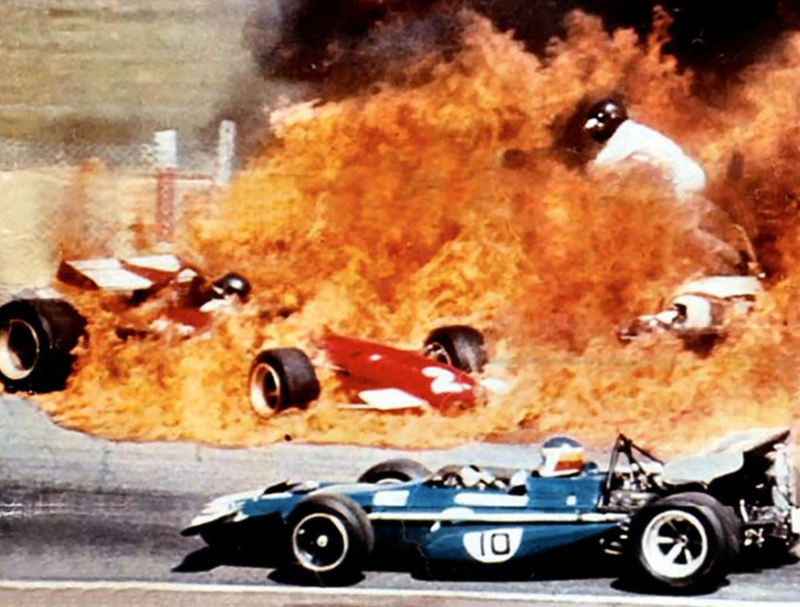 The 1967 title was won by Jacky Ickx using both Matra MS5 and MS7 chassis’, FVA powered. 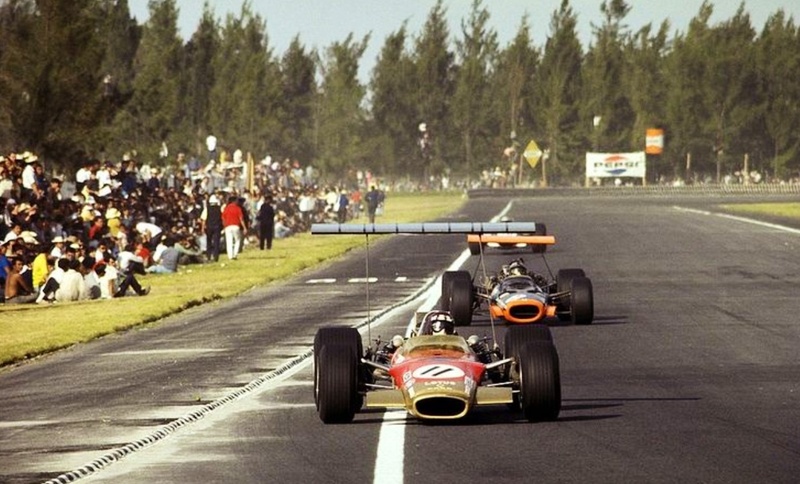 Lotus continued with the 48 in 1968, 4 chassis were built in total, but struggled again with the dominant Brabham BT23’s. 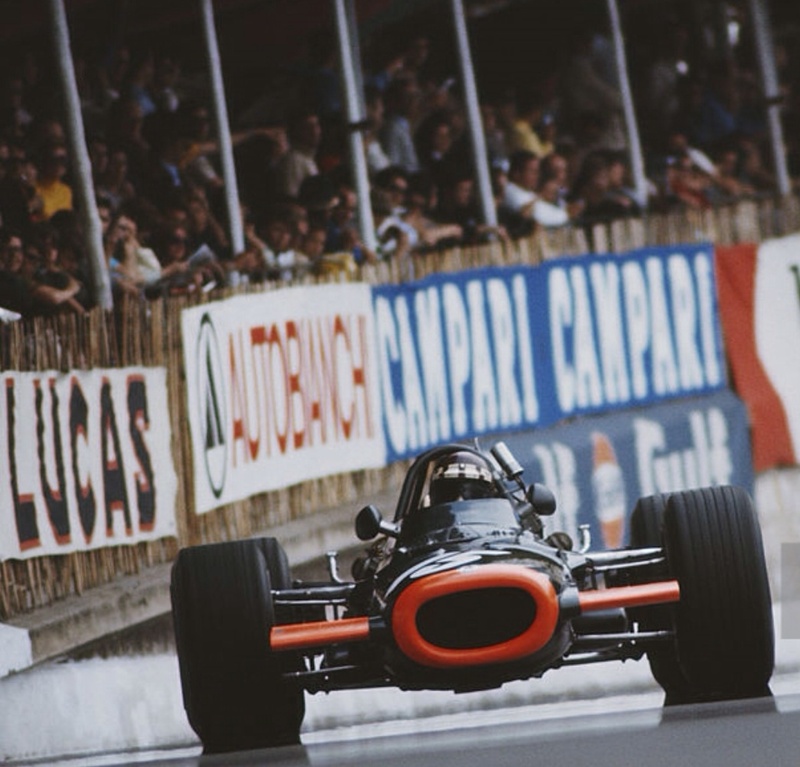 Jean Pierre Beltoise won the ’68 title in a Matra MS7 FVA. 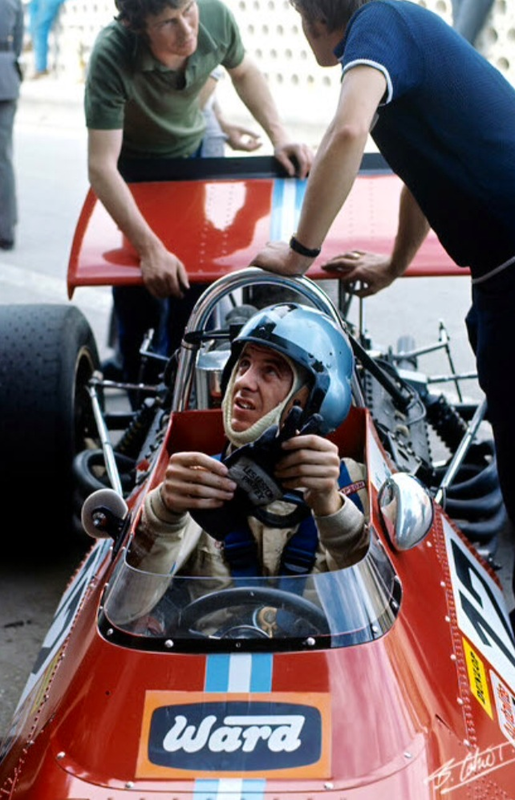 1969 would be a ‘different kettle of F2 fish’, the Dave Baldwin designed Lotus 59 a much more competitive tool. Jim Clark aviating his Lotus 48 during practice for the first European F2 event in 1968. 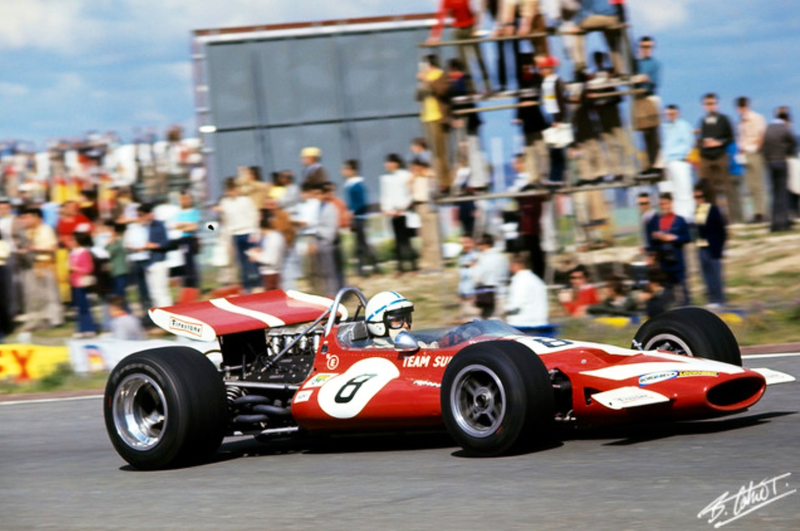 He started the season strongly with victories in his Lotus 49 in both the South African Grand Prix held at Kyalami on 1 January and the Tasman Series, including the Australian Grand Prix at Sandown Park, Melbourne. Jim won 4 of the 8 Tasman rounds, his Lotus used the 2.5 litre Ford Cosworth V8 variant, the ‘DFW’ so he came to this F2 event ‘razor sharp’. 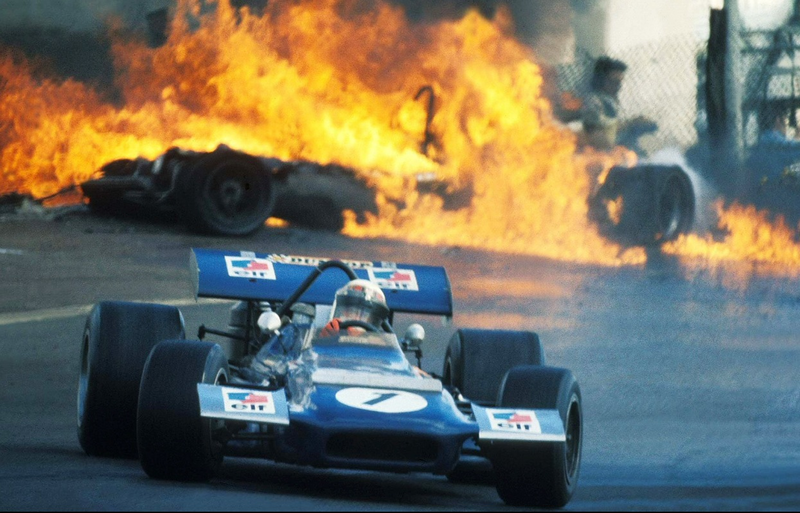 Despite Clark’s speed, Jackie Stewart won the race in his Matra MS7 FVA, Jim was tagged by Jacky Ickx at the first turn, a ‘bonzai’ move down the inside taking out the innocent Scot, deflating a tyre and rearranging the rear suspension. 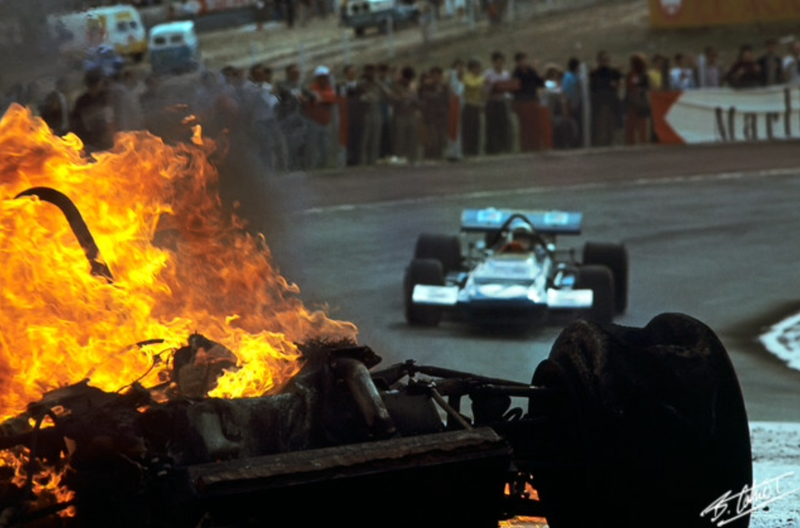 Ickx was involved in another accident on lap 2 and retired. Karma at play! 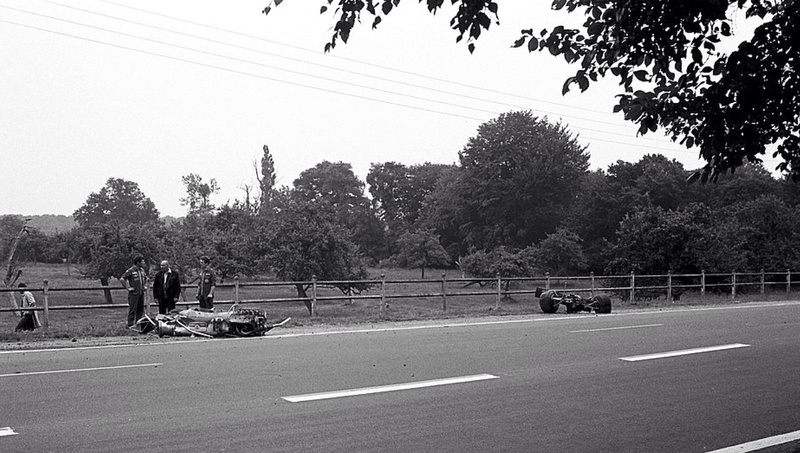 The shot below is of #1 Clark, with Hills nose in shot, in the middle is an innocent Jochen Rindt, Brabham BT23 FVA. 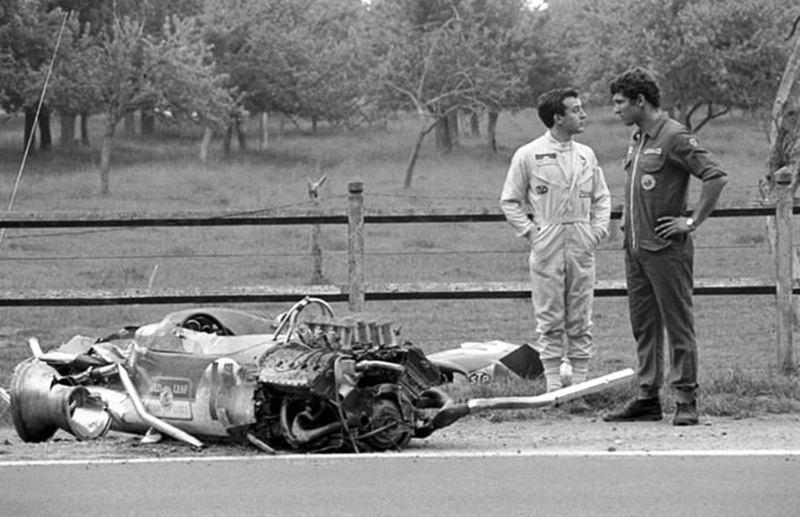 Ickx shot off down the road in his Ferrari 166. The next F2 round was the ‘II Deutsche Trophae’ at Hockenheim the following weekend. 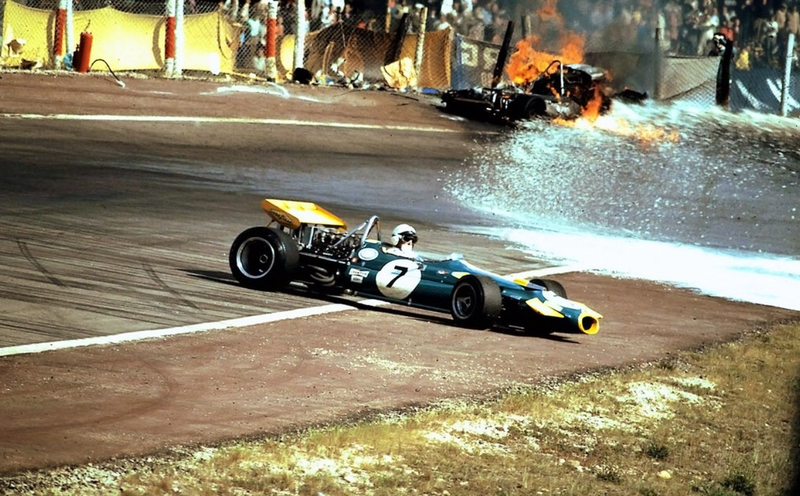 Jim Clark before the off and (below) in the early stages of this fateful, awful race and the probable high speed tyre deflation which caused the accident that claimed the champions life. Steering rack and pinion, Brakes, discs all-round, Gearbox ZF 5DS12 5 speed. Pretty much the ‘engine de jour’ of the 1.6 litre F2 from 1967 to 1971, the FVA won all of the European titles in that period. Cast-iron Ford Cortina 1600 ‘116E’ 5 bearing block, aluminium head, 1,598 cc. Bore/Stroke 85.7 mm/69.1 mm, DOHC, 4 gear driven valves per cylinder, Lucas fuel injection and electronic/transistorised ignition. Circa 220 bhp @ 9000rpm.